A conversation on eighteenth-century philosopher Denis Diderot and the battle over his encyclopedia which was considered to be full of subversive stuff. Diderot challenged virtually all of his century’s accepted truths, from the sanctity of monarchy, to the racial justification of the slave trade, to the norms of human sexuality. He is considered a prophetic philosopher who helped build the foundations of the modern world. Guest: Andrew S. Curran is the William Armstrong Professor of the Humanities and Professor of French at Wesleyan University. He is the author of The Anatomy of Blackness: Science and Slavery in an Age of Enlightenment, and Sublime Disorder, Physical Monstrosity in Diderot’s Universe. 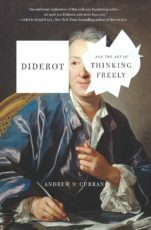 And his latest, Diderot and the Art of Thinking Freely.